As William Hill reflects on a life of 94 years, his memories are vivid. And he takes great pride in a distinguished career which includes substantial contributions to his country through the military and a prominent federal agency. The Anna, Ill., native earned a zoology degree from SIU in 1942. As World War II had broken out on Dec. 7, 1941, he enlisted in the Navy’s Reserve Officers Training School. He was called up for duty in Nov. 1942 to Northwestern University in Chicago. Upon completion of that training, he was commissioned as an Ensign. After another brief training in Washington, D.C., he was assigned to the U.S.S. Trenton, a light cruiser in the Pacific. He served on that ship until the war ended. Following World War II, he taught high school biology and general science. However, he found it difficult to make ends meet. Hill accepted an assignment to St. Louis, where he was initially involved in the inspection of unsanitary conditions in the food industry and the illegal sales of prescription drugs. He was also involved in a nationwide investigation of the sale of amphetamines to long-haul truck drivers. Hill’s 36.5-year career in the FDA included promotions and transfers to various locations in the country. After a transfer to San Francisco in 1956, he had ascended to senior inspector level and continued his duties in uncovering unsanitary conditions in major food manufacturing plants. This work led to substantial changes in plant operations and led to sanctions against responsible parties. Four years later, the SIU graduate became a compliance officer in Dallas, preparing recommendations on legal cases and assisting U.S. Attorneys. The Agency established the position of Deputy District Director in 1964. Hill was promoted to that position. He returned to the West Coast in 1967, where he supervised compliance officers and assisted the director. A year later,Hill was selected to participate in the agency’s executive development program in Washington, D.C., where he was involved with congressional correspondence, monitoring hearings and drafting testimony for the FDA commissioner to present at the hearings. In 1970, Hill was assigned as the director of the Kansas City district, but returned later that year to San Francisco to be district director. This was ultimately the position he retired in on July 31, 1984. He and his wife, Mary Ellen, reside in Lee Summit, MO, just outside of Kansas City. The couple will celebrate 70 years of marriage on October 12, 2015. In retirement, Hill has become even more appreciative of his SIU years. When he returned to campus in 2002 to mark the 60th anniversary of his graduation, he presented the University with a $100,000 gift to establish the William C. Hill Zoology Scholarship Endowment. “We had extra money and thought supporting SIU would be the best way to invest it,” he says. “The education I received at SIU truly prepared me for success in the FDA. It provided me with knowledge that allowed me to be a great fit for what the organization required. Hill recalls riding by SIU as a high school senior with his father, a World War I veteran. The elder Hill told his son that he would be attending the university someday. “I discovered that SIU taught biology and that intrigued me. It was an enjoyable experience and I learned a great deal about life,” he says. “My second year, a teacher hired me into a student worker job paying .25 cents an hour. To learn more about establishing a scholarship with an outright or estate gift, contact Gary Bogue at (405)334-2865 or garyb@foundation.siu.edu. As defending National Intercollegiate Flying Association champions, Prescott R. Dean, Sean S. Gipe and the other members of the Southern Illinois University Carbondale Flying Salukis understood they were targets. 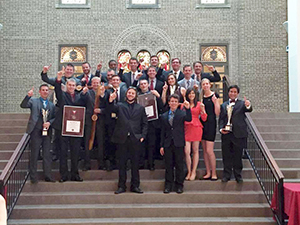 Their commitment to defending the 2014 title parlayed into a strong team effort this year as the Flying Salukis won a second straight national collegiate aviation championship Saturday at The Ohio State University. The title is the third in five years and the program’s ninth national championship. The Flying Salukis finished with 430 points and beat the University of North Dakota by 35. Embry-Riddle Aeronautical University-Prescott, last year’s runner-up, was third with 366 points. Twenty-nine teams featuring 343 students and team members competed May 11-16 at OSU Airport in Columbus, Ohio. A public reception to honor the team will be at noon, Wednesday, May 20, in the Transportation Education Center’s Multipurpose Room, 545 N. Airport Road, Murphysboro, at Southern Illinois Airport. The Flying Salukis have won titles in 1977, 1978, 1979, 1981, 1982, 1984, 2011, 2014 and 2015. Dean, with a degree in aviation management and Gipe, a senior in aviation technologies, tied for third in the nation in individual scoring. Dean earned an individual title in simulated comprehensive area navigation (SCAN) and scored in seven of the 11 ground and flight events. Gipe, meanwhile, scored in six events, including teaming with Davin L. Miles to win the message drop title. Gipe is from Media, Pa., and Miles, sophomore in aviation flight, is from Penfield. George H. Nimmer, a sophomore in aviation flight from Plymouth, Wis., was 10th in the nation in scoring. Emily K. Frasca, a May 2015 aviation management graduate from Champaign, was seventh in the nation among female contestants. As a team, the Flying Salukis placed the maximum five scorers in two events — computer accuracy and SCAN, and finished first in both ground and flight events. Ground events are aircraft preflight inspection, aircraft recognition, computer accuracy, crew resource management, ground trainer simulator, IFR (instrument flight rules) simulator and simulated comprehensive area navigation (SCAN). Flight events are message drop, navigation, power-off landing and short-field approach and landing. The top 20 contestants in each event earn points for their team. Results are available at nifa.us/SAFECON_2015_Results.html. Voges also provided a bit of perspective: the aviation management and flight program has about 300 students on campus, yet beat competitors with enrollments greater than 1,000 students. “This is comparable in the athletics world to a Division III school defeating Division I schools, and our team has done it for the second year in a row and the third time in the past five years. I am so in awe of this team,” he said. Dean, from Olathe, Kansas, said the team approached this year as a chance to build upon the program’s legacy. The win marks the first back-to-back titles for SIU Carbondale since 1981 and 1982. Dean is going to work in corporate aviation in Kansas City, and came to SIU Carbondale specifically for the aviation program and an opportunity to compete with the Flying Salukis. Team members committed to working harder each day; Dean called it a “one-day contract” with each day providing a new agreement. Knowing that other teams were looking to take the title was a motivating factor, but Gipe said a key was to keep pushing. “Putting in all of the hard work, it’s nice to have it pay off,” said Gipe, who with Miles are be captains next year. Other scoring team members were co-captain John M. Behnke, a May 2015 graduate, aviation management, from Arlington Heights; Kevin D. Grandberry, Jr., junior, aviation management, from Chicago; Michael T. Maughan, a May 2015 graduate, aviation management, from Pinckneyville; Bradley C. Smith, sophomore, aviation flight, from Dove Canyon, Calif.; and co-captain Jacob R. Schwarz, a May 2015 graduate, aviation management, from Chesterfield, Mo. Other team members are: Aaron I. Applebee, senior, aviation management from Seneca; Matthew W. Benson, junior, aviation flight; from Zumbrota, Minn.; Jon R. Dowell, senior, aviation management, from Lake in the Hills; Greysen H. Harlow, freshman, aviation flight, from Monmouth; Teddy M. Keenan, freshman, aviation flight, from Evanston; Dalton P. Thompson, freshman, aviation flight, from Geneva; and Kindra A. Wendling, sophomore, aviation flight, from Altamont. The Flying Salukis assistant coaches are Kim Carter, a senior lecturer and academic adviser; assistant instructors and former Flying Salukis Michael A. LeFevre and Stephanie J. Armstrong, and David A. Blood, an assistant instructor in aviation management and flight. 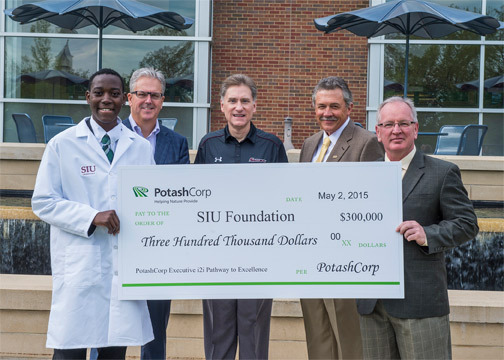 CARBONDALE, Ill. – Students in Southern Illinois University Carbondale’s College of Agricultural Sciences Ideas to Investigation program, better known as i2i, will benefit from the generosity of PotashCorp, the world’s largest fertilizer company by capacity. The PotashCorp Executive i2i Pathway to Excellence program and the Department of Agricultural Sciences received a $300,000 contribution from the corporation. David Delaney, PotashCorp’s executive vice president and chief operating officer and also a member of the SIU Foundation Board of Directors, attended a check-signing ceremony on Saturday, May 2. Other attendees included SIU President Randy Dunn; College of Agricultural Sciences Dean Mickey A. Latour; and Greg Cook, president of the SIU Foundation Board of Directors. The PotashCorp Executive i2i Pathway to Excellence program creates new options for students interested in conducting mentored research to address issues facing agricultural industries. Ideally, students work on research projects directly relevant to and immediately applicable to industry partners. Students who participate in the program learn from their research mentors and from each other while gaining valuable practical experience. Latour initiated the fledgling i2i program in the spring semester 2014 to provide an avenue for practical research skills, and opportunities for immediate application of what is learned to give students a real-life foundation for building career skills. With the contribution from PotashCorp, the next phase, the Potash Executve i2i Pathway to Excellence, will focus on developing the next generation of highly trained executive talent with premier leadership, critical thinking and problem-solving skills. The program is a collaborative program with SIU and Purdue University. As the world’s largest crop nutrient company, PotashCorp plays an integral role in global food production. The company produces the three essential nutrients required to help farmers grow healthier, more abundant crops. With global population rising and diets improving in developing countries, crop nutrients such as potash, phosphates and nitrogen offer a reasonable and practical solution to help produce the food we need from the land we have. For more information about PotashCorp, contact Rhonda Speiss at Rhonda.Speiss@potashcorp.com.